Southern Illinois University Edwardsville alumna Ashley Ho will see her artwork displayed in a scene on the CBS series “NCIS New Orleans.” The episode is scheduled to air on January 8, 2019 on local CBS affiliate KMOV-TV (Ch. 4). As a group, SIUE art and design students put their talent to work in an interdisciplinary collaboration for International Studies Day coordinated by Sorin Nastasia, PhD, associate professor of public relations and director of internships in the Department of Applied Communication Studies in the College of Arts and Sciences, and director of the International Studies Program. The NCIS Set Decoration Department has a scene that takes place in a college classroom for international affairs. 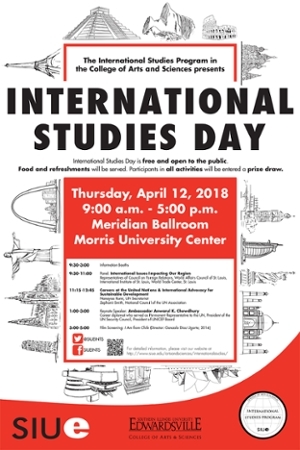 They requested the SIUE International Studies Day poster, flyer and schedule for a bulletin board as background set decoration. Ho, a Peoria native, graduated in May of 2018 with a bachelor’s in studio arts with a focus in graphic design and ceramics. She was surprised to discover that her poster will end up in the TV show. “I feel humbled by the opportunities I have found through SIUE,” she said. “It’s interesting how far my work can go. A freelancer at this stage of her career, Ho’s goal is to keep working and searching for the right company in which to thrive in a collaborative environment. “In my freelance work, I work hard to create a personal brand for potential clients,” she said. The third annual SIUE International Studies Day will take place Thursday, April 11, 2019. Organized by the International Studies program, the event is supported with a grant from the College of Arts and Sciences Targeted Funded Initiative.